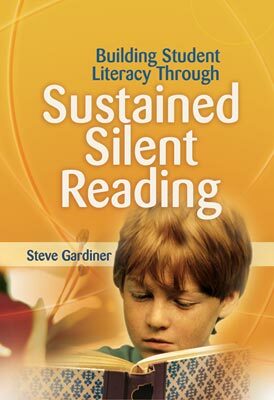 Sustained silent reading is a time during which a class, or in some cases an entire school, reads quietly together. Students are allowed to choose their own reading materials and read independently during class time. Most programs encourage students to continue reading outside of class and permit students to change books if they lose interest. Most important, SSR allows an adult to model the habits, choices, comments, and attitudes good readers develop. Although most programs do not require traditional book reports, some do offer opportunities for students to talk or write about their readings. Although SSR programs share certain characteristics, teachers have adjusted the general concept to fit the specific needs of their students and schools. Sustained silent reading is referred to by a number of different names across the country. In its purest form, FVR (free voluntary reading) allows students to read any materials they choose, including books, newspapers, magazines, and comic books. Programs include DEAR (drop everything and read), DIRT (daily independent reading time), LTR (love to read), USSR (uninterrupted sustained silent reading), POWER (providing opportunities with everyday reading), FUR (free uninterrupted reading), IRT (independent reading time), SQUIRT (sustained quiet uninterrupted reading time), WART (writing and reading time), SSRW (sustained silent reading and writing), and a host of other catchy acronyms and abbreviations. First described by Lyman Hunt of the University of Vermont in the 1960s, SSR gained popularity in the 1970s. In the 1980s, many schools across the nation experienced rooms of quiet readers, although SSR was often criticized for the general lack of student accountability inherent in the programs. By the 1990s, SSR received strong competition from technology-based reading programs like Accelerated Reader software, which brought computer quizzes on selected books into the classroom. In the new millennium, the National Reading Panel reported that SSR programs were not an effective means of teaching reading, renewing a debate that has followed SSR throughout its history. In spite of that report, interest in silent reading remains high, perhaps fueled by an increasing number of district- and state-required assessments and by the Elementary and Secondary Education Act (No Child Left Behind). These high-stakes assessments have left many teachers and administrators looking for successful, cost-effective ways to improve student reading. Worried about the “teach-to-the-test” mentality these assessments foster, some educators are concerned that students may become successful at taking tests but cease to enjoy reading. Because SSR is inexpensive and focuses strongly on reading for enjoyment, it may be the perfect answer. A significant number of research studies have examined sustained silent reading programs, evaluating their effectiveness with students from primary grades to graduate school (see Chapter 6), and most of these studies show that SSR is successful in promoting and improving student literacy. The theory behind sustained silent reading is that if students read more and enjoy it more, they will become better readers, the same theory that drives the basketball player to stand at the free-throw line after practice each day and shoot 100 free throws. By the end of the season, he will be a better shooter, whether he has direct instruction or not. While practicing shooting, he will apply what he learns each day to the next day's practice. Readers are the same. As they read each day, they encounter new words, usage, sentence structures, and ideas. Each day adds to their total experience and makes the next day better. With increased practice, reading becomes easier and—this is important—more enjoyable. Like the basketball player and his team, readers in SSR classrooms share the reading experience with their classmates and teacher. They talk about their books, trade recommendations, and see fellow students and at least one adult engaged in the reading process. Krashen believes silent reading programs are the most effective way to teach not only reading proficiency, but also all the skills related to reading. Success through FVR is based on what he calls “the complexity argument.” Language, he says, “is too complex to be deliberately and consciously learned one rule or one item at a time” (1993, p. 14). This argument applies to grammar as well as vocabulary. “Not only are there many words to acquire, there are also subtle and complex properties of words that competent language users have acquired” (p. 14). Minor differences in usage may cause words to have very different meanings, presenting a challenge that students will not be able to meet by studying words from vocabulary lists alone. vocabulary teaching methods typically focus on teaching simple synonyms, and thus give only part of the meaning of the word, and none of its social meanings or grammatical properties. Intensive methods that aim to give students a thorough knowledge of words are not nearly as efficient as reading in terms of words gained per minute. In fact, Nagy, Herman, and Anderson (1985) argue that picking up word meanings by reading is 10 times faster than intensive vocabulary instruction. Their suggestion is not to do both instruction and reading—the time is better spent in reading alone. Reading is difficult, serious business. Literature is even more difficult and serious. Reading is a performance for an audience of one: the teacher. There is one interpretation of a text: the teacher's. “Errors” in comprehension or interpretation will not be tolerated. Student readers aren't smart or trustworthy enough to choose their own texts. Reading requires memorization and mastery of information, terms, conventions, and theories. Reading is always followed by a test (and writing mostly serves to test reading—book reports, critical papers, essays, and multiple choice/fill-in-the-blank/short answer variations). Reading somehow involves drawing lines, filling in blanks, and circling. Readers break whole texts into separate pieces to be read and dissected one fragment at a time. It's wrong to become so interested in a text that you read more than the fragment the teacher assigned. Reading is a solitary activity you perform as a member of a group. Readers in a group may not collaborate: this is cheating. Re-reading a book is also cheating; so are skimming, skipping, and looking ahead. It's immoral to abandon a book you're not enjoying. You learn about literature by listening to teachers talk about it. Teachers talk a lot about literature, but teachers don't read. Teachers are often bored by the literature they want you to read. There's another kind of reading, a fun, satisfying kind you can do on your free time or outside of school. Students must read for the entire period. They cannot do homework or read any material for another course. Reading workshop is not a study hall. They must read a book (no magazines or newspapers where text competes with pictures), preferably one that tells a story (e.g., novels, histories, biographies rather than books of lists or facts where readers can't sustain attention, build up speed and fluency, or grow to love good stories). They may not talk to or disturb others. There are no lavatory or water fountain sign-outs to disturb me or other readers. In an emergency, they may simply slip out and slip back in again as quietly as possible. Atwell's approach has some restrictions (no magazines), which technically remove it from the free voluntary reading category but make it a good example of how a teacher can modify sustained silent reading to meet her own needs and those of her students. Atwell notes that students are free to “sit or recline wherever they'd like,” which is an example of another option. Some teachers provide couches or beanbag chairs in the classroom. Some create reading corners or lofts, while others have students remain in their seats. Many factors would become part of a teacher's decision about organizing a room for SSR. When I read and hear about ways teachers have adapted SSR to fit their needs, I'm amazed at what a democratic process it is. Used successfully throughout the United States and in many other countries, with students of every age group and every reading ability, it's not a one-size-fits-all garment, but with a little stretching here and a little tucking there, it can be made to fit any situation. What provides this utility? The major premise behind any sustained silent reading program—that reading should be enjoyable. Students still need assigned readings from the core curriculum. They need discussions and quizzes, but not on everything they read. SSR offers students a chance to make choices and to take control of part of their education, a very powerful concept for them. Teachers work with students in a different way, as a mentor would: assisting in book selections, helping students past difficult parts in their books, acting as a sounding board for student reactions to their reading. We all love to do things we enjoy. No one has to teach us to enjoy an afternoon at the beach splashing in the waves. No one has to instruct students that “hanging out with friends” is fun. We seek out things we enjoy and avoid things we don't enjoy. Students who learned about reading based on Atwell's list of negative modeling probably don't enjoy reading and don't seek it out. However, I suspect a high percentage of students who sat in her reading workshops in the 1980s are avid readers today. As coach of the cross-country team each fall, I recognize similarities between “coaching” sustained silent reading and coaching distance running. At the beginning of the season, runners are out of shape and still in a summer frame of mind. As they become fit, feel the success of improving their times at races, and share the “runner talk” on the bus and in team meetings, their motivation for running becomes less external—me giving them the workout for the day—and more an intrinsic sense of wanting to feel the motion as they float over the hills in the park on a beautiful October afternoon. Perhaps the most satisfying part of my coaching comes on those days when I am driving home from school and see a runner who graduated four, five, or six years ago jogging down the street. I honk. The runner waves, and we both smile. SSR is the “lifetime sport” of the academic world, and I wish I could drive past the houses of former students, see them reading, and honk. When students participate in sustained silent reading and enjoy books they have chosen, reading becomes a flow activity. Watching students during SSR time reveals that most, if not all, have become so involved in their reading that they are no longer aware of others. They laugh, they frown, they shake their heads; occasionally, they blurt out in amazement or anger because of something a character has said or done. It may seem humorous, but it clearly shows they have become involved in their reading and have found the balance Csikszentmihalyi describes as forward movement. Reading and writing impose this order. Students often say, “Oh, I was really getting into my book” when SSR time ends. They like the feeling of getting that involved, and after they experience it a few times, it becomes easier and easier to return to that level of concentration with each reading session. For some, that level of involvement defines a good book. Students in SSR classes often report feeling like this. Any reader who has glanced up, surprised to see that it is 1:00 in the morning, knows exactly the feeling. The nature of sustained silent reading is such that it not only fosters the kind of challenge that leads to forward movement, but also sets the stage for concentration and the transformation of time explained by flow theory. While it is easier for researchers to measure student progress in vocabulary, grammar, or fluency, greater reading enjoyment is what will lead a student to lifelong reading. SSR creates the flow activity that supports enjoyment. Any teacher who has shared SSR time with students has seen it happen, often as quickly as the second week of the program. The flow experience is very real, but it can pose one danger for teachers. As Csikszentmihalyi discovered in his research, flow is universal. It crosses cultural and economic boundaries with ease. It doesn't discriminate based on age. I long ago lost track of the number of times a student cleared his or her throat or tapped on a table to bring me out of the depths of a book, only to discover that our 12 minutes or 15 minutes of reading time had suddenly turned into 26 minutes or 30 minutes. Although it may be embarrassing for a moment and may lead to some scurrying to catch up with the planned lesson, it provides a different sort of modeling for students to see. Adults get engrossed in their reading, and students need to see that. Research shows that SSR works in teaching second-language students. Two experiences had taught me this even before my impressions were confirmed by Krashen, who wrote, “FVR is also, I am convinced, the way to achieve advanced second language proficiency” (1993, p. x). I had experienced this myself in 1981, teaching at the American School of Lima, Peru. As soon as I stepped off the plane at Jorge Chavez International Airport, I realized I was in trouble. My one year of high school Spanish (far too many years in the past) wasn't going to help me, so I quickly did what I thought was the right thing. I hired a tutor. Rosanna was an excellent teacher, and we went through pages in her textbook and wrote sentences and vocabulary words in a notebook. I studied hard, but still found myself hoping that when I was out in the city, the waiter or store clerk who helped me would be the one who spoke at least a few words of English. That was seldom the case, and I ended up pointing at pictures on the menu or writing prices on a piece of paper. Then one day I picked up a copy of El Commercio, the largest daily newspaper in the country. The first day, it took an hour, with frequent references to my dictionary, to read the banner story. Within two weeks, I could read the front page in an hour, and within two months, I could read the newspaper much as I would at home. The biggest benefit, however, was in the vocabulary and sentences I learned. The banner news was the Falkland Islands war, so I learned about rockets, tanks, ships, and other military terms. Suddenly, I could understand conversations on the street—real people talking, not just words from the vocabulary lists in Rosanna's grammar book. I learned to follow World Cup soccer scores, the progress of the Peruvian national women's volleyball team, local authors' book signings, and a host of other events and issues that were the topics of daily conversations. By then, every person I met was my language teacher. I talked with taxi drivers, shopkeepers, and people on the street. My time in Lima was immediately more enjoyable. I went back to the hotel and opened my suitcase. I took out all the books we had, even removing my bookmark from the one I was reading at the time. I could always get others; it was clear these books were more valuable to him. When we met near the statue of Lenin, I handed him the stack of books. His eyes brightened. The books would supply hours of work and pleasure for him.